Pulitzer Prize-winning Native American author N. Scott Momady’s story comes to full living cinematic splendor thanks to the documentary storytelling skills of Jeffrey Palmer in his directorial debut “Words From A Bear.” Momaday, a Native American from the Kiowa Tribe, has had a remarkable life which resonates with incredible strength and emotion as we walk back in time, following his footsteps, and experiencing his youth, elders’ lessons, and finally his own teachings. “Words From A Bear” is a vibrant and mesmerizing story connecting us with him, our own history, humanity, and most importantly the land upon which we are charged with caring. We meet the elderly, yet very mentally spry Momaday, now seated in a wheelchair, having his photo taken professionally. With a candidly sly comment, we are at once enchanted by his voice and his knowing smirk. The award-winning author holds nothing back as he relays his ancestry and their storytelling techniques, describing these memories of history. 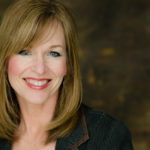 Using archival photos and sweeping landscape cinematography, we hold images of the Great Plains, the desert, and the blood that was shed over the years, yet the spirit remains strong within those who are connected. As we see these images, Momaday’s balanced and symmetrical utterances elegantly glide over your mind and heart, saturating and satisfying your thirst for knowledge while the words comfort you. Momaday’s open portrayal of who he is and how he came to be is luxuriously poetic. It strikes an intrinsic chord as we watch images of a man, his world, and nature as it changes with great meaning over the decades. Never have I been transported, imaginatively whisked away by a voice, a tone, a timbre as I was by Momaday’s meaningfully lyrical and emotive descriptions. I could feel the texture of the surroundings he described as an inexplicable emotion welled up within me. Artistically, Palmer then skillfully interjects interviews with celebrities who have known Momaday and his writings such as Robert Redford, Jeff and Beau Bridges and Native American scholars across the continent. This gives viewers just a sample of the impact Momaday’s work has had on our literary world. “Words From A Bear” provides a better understanding of the plight of Native Americans and the beautiful craft of verbal storytelling. While literature, as pointed out in the film, is a storytelling craft in writing, so too is it in the word of mouth form. To listen to Momaday’s stories as he recalls his childhood and his name’s origin, he elicits a focus with his calming presence, engaging you as he reassures you that there is hope within the understanding of nature. 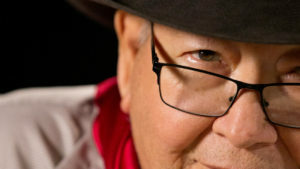 Palmer has a keen sense of storytelling as he gives Momaday his time and space on screen, but he augments every aspect with not only the interviews from celebrities and scholars, but also with capturing landmarks from the past, photos from bygone days, and graphic art as he maintains Momaday’s voice and words. We step not only back in time to understand an unwelcoming and intolerant era but also get to know Momaday’s direct ancestors and their personalities through eloquent and rich descriptions. We see through oral storytelling how the ancestors live on via this art and their spirit. It is the spirit, the strong spirit in his voice, that we gain insight into our own past, his past, and how we are all connected. As Redford said, Momaday has a “spiritual poetic connection to the land” and “Rock Tree Boy” as he was named by an elder, is our connection. “It is the spirit that counts and it is the spirit that is indomitable,” says Momaday and he is truly an indomitably spirit. I am truly grateful for my own discovery of this great man, his essence, his knowledge, his words, and most importantly, his spirit. I am changed by having seen this film, gaining an understanding of a history I didn’t fully know and somehow identifying with his story. This is a film to connect us all and give us a greater understanding of who we are and who we can be. And it is with sincere gratitude that I give to Jeffrey Palmer for bringing this man and his story to everyone. 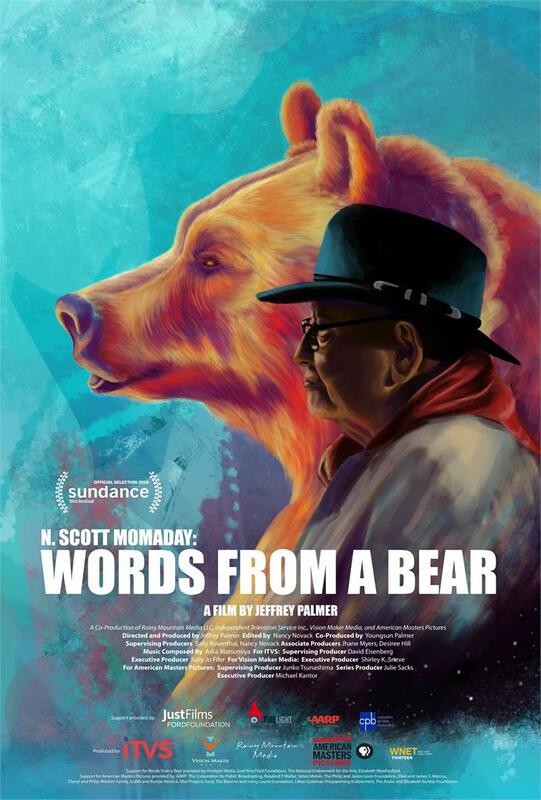 “Words From A Bear” premiered today, January 29th at the Sundance Film Festival and will continue to have 3 additional screenings. Go to SUNDANCE.ORG for more information and watch for an upcoming interview with Jeffrey Palmer!